Color science is the key to making a shade stunning on all skin tones – Fair to Deep, Rosey to Golden. We blended Pink and Peach, (cool and warm shades that both brighten the face) then added equal parts Silver and Gold, for a gorgeous light-catching shimmer. For a little “oomph!” we made it slightly darker than the natural lip color and the natural flush of the cheek, and voila – Simply Beautiful! Simply Beautiful Lip Gloss – This smooth and creamy lip gloss is infused with Vitamin E, Jojoba Oil, Grape Seed Oil, Shea Butter and Avocado Oil to help keep lips hydrated, moist and stunning. 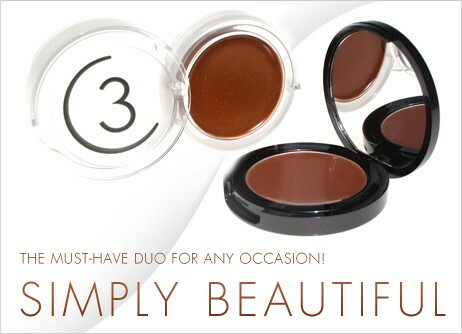 Simply Beautiful Cheek Tint – This unique and modern texture is fresh and dewy on the cheeks, and is easily applied with the fingers for a youthful glow. For an easy, polished look, apply the Simply Beautiful Duo to the lip and cheeks, define the eyes with Opaline Creme Eye Definer and groom brows with our Tinted Brow Gel. Getting gorgeous has never been easier! This unique and modern texture is fresh and dewy on the cheeks, and is easily applied with the fingers for a youthful glow.